Now we all know of Audio Technica’s flagship studio headphones, the ATH-M50 and the more recent ATH-M50x, but behind them, lurking in their shadows are the rest of the headphones in Audio Technica’s M-series line which are all very good. These headphones come with exceptional build. It’s not aluminium or anything, but instead they are constructed with very, very high quality plastic. 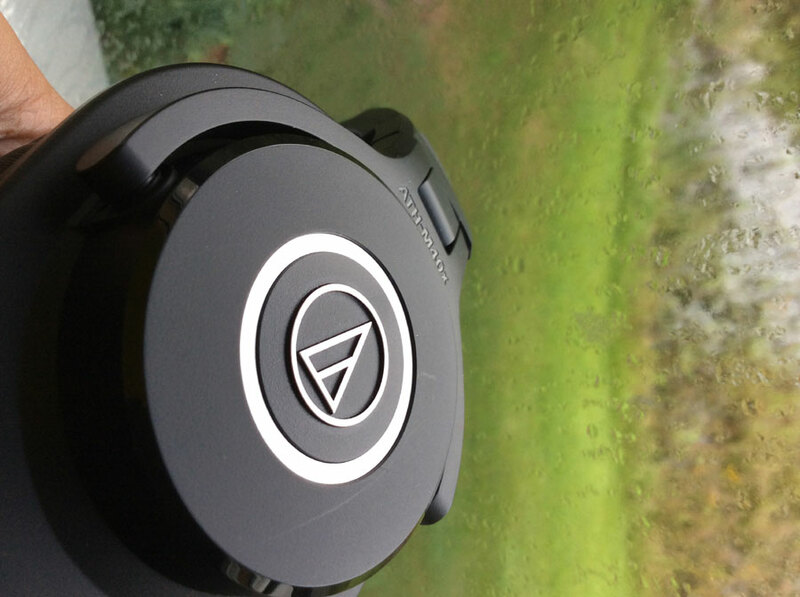 The headphones come in only one colour, matte-black with metal accents on the sides for the logo. These headphones are HUGE, seriously. The size is understandable though because the headphones come with 40mm drivers. However, the proportions of the headphones don’t affect comfort in any way. You can easily wear these for 7 hours in a stretch without any signs of fatigue. The headphones might be large, but they aren’t very heavy. This is in part due to the plastic build which allows it to be lightweight. The headphones also come with a carrying pouch,although I doubt how well they will be. The ATH-M40x comes with two detachable cables in the box with the headphones. A straight 3.0m cable and a coiled 1.2m cable which stretches to 3.0m The only disadvantage to this is that the headphones work only with the provided cables or the ones you can get from Audio Technica. This is because the cable has a proprietary lock which locks the cable in place on the headphone end so the cable doesn’t open accidentally. Also in the box is a connector to convert the 3.5mm plug to a 6.3mm screw on adapter plug to connect to your workstation. Now the part where which really matters for these cans. These headphones come tuned flat, so even though some people may not like it because, say, they don’t deliver “enough bass”, true audiophiles and professionals will love it. That said, these headphones do lack some bass. The smaller driver size means you won’t get the same “oomph” you get from the M50x, but compared to the rest of the headphones at this price you can’t really complain. 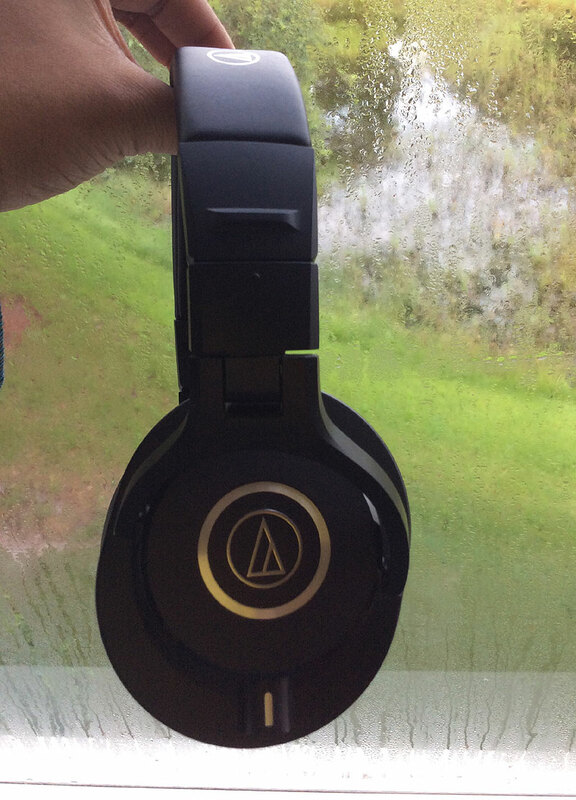 That said, ATH-M40x headphones get the mids and the highs right and you won’t miss any quality from vocals and guitars. Most consumer headphones are tuned to give a perception of some extra “oomph”, but because these won’t give you that, they might sound flat, and bland. But try getting used to these and you will never pick up tuned headphones again. Over my use, I realised that these headphones leak quite a lot of sound. The pads don’t give much of a tight seal to provide more comfort, so that might be a nuisance when listening to music in public places. I didn’t want to get these headphones initailly. I was originally planning to get the M50x, but then I found these headphones lurking behind the M50x (literally). I won’t lie and tell you that there isn’t any difference between them in terms of sound quality, because there is some. But there isn’t a ton of difference. You get a bit more of bass, slightly lower volume and one less cable. But if you are ready to trade those off for $70-$100, then go get these headphones, because these are the best over-ears you can get for a reasonable price. Do these and the m50x work with lumia 535? @Fahad Zaman: i think you cannot get M50x in Dhaka. But still you can get it from Amazon, there are some company in Dhaka helps you purchase. i got mine in this way. Did you get it from abroad? I’ve been looking for the M50x in Dhaka. Do you know where i could find them?